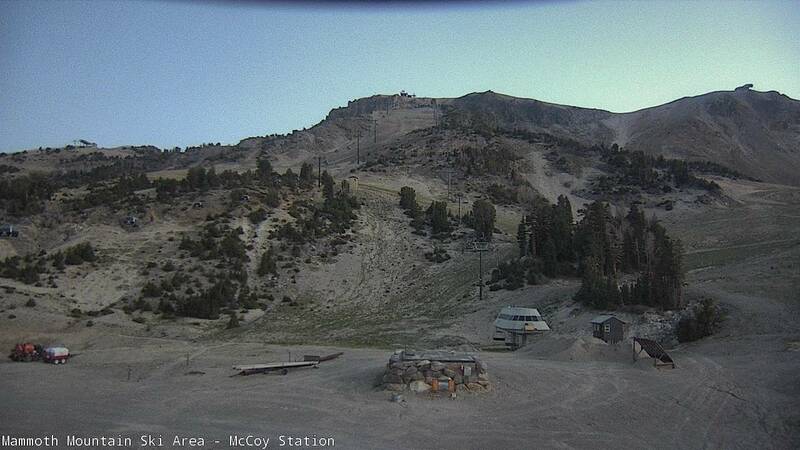 Monday @ 7:30 AM – Good morning from Mammoth Mountain. Spring Skiing and Snowboard is going off up on Mammoth Mountain with a 5 – 10 foot base. Lifts running for mid week will be 1, 2, 3, 6, 11, 23 and G1 and G2. No one around so you have the place almost to yourself. The Snow is firm early and starts to get soft by 9 AM on the lower lifts. Weather this week will be warm with highs near 60 at Main Lodge with lows 30-35 out on the hill. We do have a chance of an isolated thunder storm that could bring us some snow showers after lunch each day. If that happens it would just be a trace of new snow. Spring has Sprung, my advice is ski 9-12 get lunch and then hike or take a mountain bike ride. The path up the Sherwin Lakes is almost all snow free now and the USFS mountain bike trails are all open. SPRING SNOW TIP: Hint if you’re skiing in spring snow leave your winter groomers skis at home, they are never going to be much fun in the slush, get a pair of wide rocker skis and you will be having a blast. It’s also a must to get the surface of your skis or snowboards textured for spring. Both Footloose and Fast Ski Sports can do that for you. Snowman did it last year and the spring was so much more fun. A lot of you have been asking how long the ski area will run, at this time they are telling us Memorial Day will be the closing of winter sports. Fast Ski Sports is having a Spring Sale with a savings of 20-40% on this years gear. Mention the Mammoth Snowman and you can save an extra 10% off the already discounted price. Matt also as a second offer for you, he has a used ski and boot clearance going on. Anyone mentioning the Mammoth Snowman can rent or demo that equipment 1 day for free.